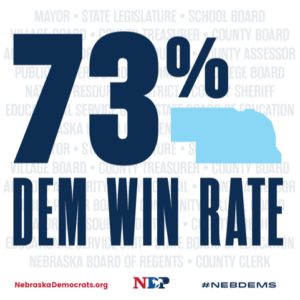 A whopping 73 percent of Democrats who ran for office in the General Election across Nebraska won according to preliminary calculations by the Nebraska Democratic Party. In all, 850 Democrats ran statewide. Election results will be officially certified by the Board of State Canvassers on Dec. 3. But of the 794 races that the NDP checked the results of, 580 — or 73 percent — of the Democrats won. To celebrate 73% of our Democratic candidates winning, we are looking for 73 new monthly donors to help us continue this work. Three legislative districts flipped, sending Steve Lathrop, Machaela Cavanaugh and Wendy DeBoer to the capital while all of our Democratic State Senators won re-election. Two women won University of Nebraska Board of Regents races — Barbara Weitz and Elizabeth O’Connor. Before their election, no women were currently represented on the critical board. Two women — Deborah Neary and Maureen Nickels — were elected to the State Board of Education, bringing the total of Democrats on the board to four out of eight. Forty-one Democrats winning in 47 of the Natural Resource District races. Democratic candidates and the NDP all worked to get Medicaid Expansion across the finish line from collecting petition signatures to including the ballot on our Voter Guides and candidate materials. The Nebraska Democratic Party was proud to field over 850 candidates in the 2018 election, compared to the previous high of 515. From the races for U.S. Senate and House, statewide offices, the Legislature and scores of local races, the NDP fieded an impressive slate of candidates that looked and sounded like their communities. Lancaster County became Nebraska’s new “Blue Dot” as Democrats won every county race where a Democrat was on the ballot. Nebraska Democrats made significant gains in the Legislature — flipping three seats from the GOP and protecting every single Democrat who ran for re-election. In District 26, Sen. Matt Hansen won a second term, Sen. Patty Pansing Brooks was unopposed and won a second term in District 28, as did Sen. Adam Morfeld in District 46. The Democratic Legislative gains were led by the return of Lathrop, who beat incumbent Sen. Merv Riepe in the 12th District race. Lathrop served two terms in the Legislature before leaving because of term limits and sitting out a term. Additionally, Megan Hunt won her District 8 race and and becomes the first member of the LBGTQ+ community elected to the Legislature in Nebraska. Headed into the 2018 election, Republicans maintained control of the chamber, with a 32-15 majority. When the 2019 sessions convenes in January, Democrats now control 18 seats — a complete game-changer for property tax reform, health care and education funding. The sheer number of Democratic candidates this year reflected the NDP’s aggressive party-building efforts. We are focused on critical infrastructure efforts reflected in the fact that we now have 73 county party chairs, compared to 41 in 2016. — For the first time, the NDP created Voter Guides listing all the Democratic candidates in each of Nebraska’s 93 counties this year. Those were mailed to each Democratic household in Nebraska and also were listed online. More than 325,000 Voter Guides were delivered at the door and by the mail. — A total of 67,774 Democrats requested Vote-by-Mail ballots in 2018 — a 59 percent increase from 2014. — As of Nov. 5, there were 67,673 Democratic ballots returned statewide, according to the Nebraska Secretary of State’s office. That’s a nearly 81 percent increase from 2014, when 37,403 Democrats voted early. — The NDP sent 280,665 texts to 260,462 voters. — New voter contact technology was available to candidates up and down the ballot, who made an impressive 760,832 text contacts with voters and utilized a state of the art Voter File to win elections. — The NDP contacted an additional 19,090 voters thru robo and live calls to support the entire Democratic ballot. — The NDP’s virtual phone bank also was available to candidates up and down the ballot, who made an impressive 77,895 phone calls to voters. — The NDP opened 6 offices across Nebraska hiring over 16 canvassers in CD2 alone. — The NDP founded a Candidates of Color Fund distributing money to candidates representing African American, Asian, Latinx and Native American communities adding needed diversity to our ticket. — The NDP recruited and trained over 550 volunteer “Block Captains” to encourage people to vote in the Nov. 6 election and to register voters in their communities. Block Captains were each assigned 50 voters in their neighborhood knocking on their doors at least two times this election cycle resulting in over 55,000 volunteer contacts with voters.